How weird is it that one day I’m painting a big ol’ wall mural and the next I paint teeny-tiny ladybugs on a thrift store picture frame? Let’s just say the teeny-tiny paintings are a whole lot easier on my knees and back! I painted this frame for the geraniums – the 2nd in my Indoor Garden Painting class. Just like the bees, start with little ovals, only red this time. A few black dots, couple lines, and you have a itsy-bitsy lady bug . . .
. . . and a couple of ladybug friends. These were so much fun, I wanted to do some more – only bigger. Ah, but I had other painting commitments today before I go back to the mural tomorrow. So I did what I always do when I want to ‘feel’ creative without actually ‘being’ creative – I went bloghopping. First stop – a fun birthday theme party. Doesn’t this make the cutest party?!? 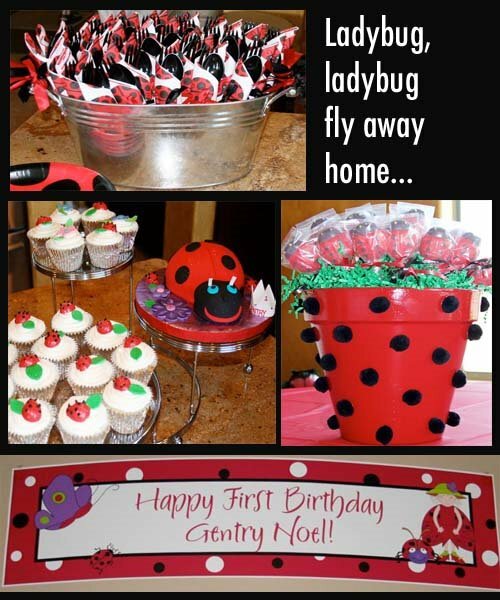 You can see a lot more at Design Dazzle’s post on ladybug themes. Then I knew I had seen some cute ladybug crafts, but I couldn’t remember where. Instead of just searching the web and reading a bunch of links, I searched Images – sooo much more fun! Right on the first page I found her – that crafty gal, Amanda, at Crafts by Amanda. Look closely – these are plastic lids! Cute, right? 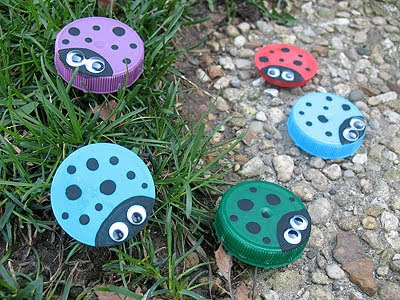 Oh, but you have to read Amanda’s tutorial on these ‘cause she has a lot more ladybug craft projects. I really love how she made them in all different colors and not just red. Oh, I love red, but the multi-colors would be just darling in the garden, wouldn’t they? Well, that’s it for my day-of-resting-my-back-and-knees. Tomorrow I’m back up the ladder, painting the other wall. Wish me luck. Better yet, pray for me.